Between March and September 2012 there have been sixteen instances of 'necklacing' in the townships just outside of Cape Town. This article argues for understanding these events in relation to the violence of apartheid. It approaches the question of the meanings of the persistence of necklacing through an analysis of photographs of people who had been subject to vigilante violence in the 1980s. The article focuses on the work of Gille de Vlieg, a photographer who, during apartheid, was a member of the Black Sash and of the Afrapix photography collective. I read de Vlieg's photographs as a series of 'wounding apertures' that open a space for affective engagements with the violence of both the past and of the present. The importance of such engagements, the article argues, lies in what political philosopher Hannah Arendt has theorised as the constitutive relation between feeling, thinking and judging. Absence of emotion neither causes nor promotes rationality. 'Detachment and equanimity' in view of 'unbearable tragedy' can indeed be 'terrifying,' namely when they are not the result of control but an evident manifestation of incomprehension. In order to respond reasonably one must first of all be 'moved', and the opposite of emotional is not 'rational', whatever that may mean, but either the inability to be moved, usually a pathological phenomenon, or sentimentality, which is a perversion of feeling. Three men are pictured kneeling: two of them bow their heads while the terrified face of the third man is clearly visible. All three are encircled by tyres and by the crowd of people that has assembled around them to watch as they are set alight and burnt to death. Many of the onlookers are children, one of whom appears frightened; one woman in the crowd holds her hand over her face. Printed below this image, and alongside an article that refers to the incident as 'kangaroo court killings', is a photograph of the men burning to death, their bodies engulfed in flame. At the lower left-hand corner of the image is the body of one of the men who somehow crawled his way out of the fire, his skin is charred and ashen, his body is pressed to the sandy ground, his head is obscured by the arm of a person standing in the foreground. A short distance away from the burnt man and from the marks his body has made as he dragged himself away from the large fire is a smaller mass of flames with a dark cloud of smoke immediately above it. This too appears to be a person who attempted to escape but who was already burning too intensely to do so. Five days later the same image of the three men who were 'necklaced' is re-printed in the newspaper.2 This time it is accompanied by a photograph of the site where a man who was accused of stealing copper wire was burnt to death in the same way. The image shows approximately twelve shacks built along the side of a dune, and in the foreground, an expanse of dry, sandy earth, patches of vegetation and, by my count, no fewer than forty-five tyres. The photographs described above were taken in Khayelitsha, the largest of several townships and informal settlements situated outside of the city of Cape Town, in March 2012. The images of the necklacing were taken on a cellular telephone by a woman who lives in Khayelitsha and who was witness to the event.3 It is notable that the images were not taken by a documentary photographer, as they almost certainly would have been during the time of apartheid, had the necklacing been photographed at all. That there were no documentary photographers to bear witness to the necklacing that took place eighteen years after apartheid's legislative end is perhaps unsurprising. However it is not insignificant. The absence of documentary photographers from the scene of post-apartheid violence provides an indication of how what was once widely understood to be the role of social documentary photography in the country has been re-aligned and re-directed in the present. The end of apartheid brought with it the end of the grand narrative of oppression/resistance and also led to the end of the collectives, like Afrapix, which were centred on documenting the violence of apartheid, both structural and physical. The townships were the primary location of South African history-making for Afrapix photographers and recording the violence of the state and resistance to it in order to campaign for the end of apartheid was the raison-de-etre of the collective. The Afrapix archive is a collection that contains many of the photographs that appeared in newspapers in South Africa and across the world at the time that they were taken and that have circulated through exhibitions, books and online media ever since. The collection also contains many of the most famous images taken under apartheid and which, considered together, provide a compelling visual history of the struggle years.8 The existence of Afrapix was instrumental in the production of what we now recognise as the history of the struggle.9 Documentary photographers played a central part in shaping the representation of oppression and resistance during apartheid and certain of the images taken in that time have played a key part in the making of history post-apartheid. As Patricia Hayes has pointed out, the work of social documentary photographers under apartheid is far more heterogeneous and complex than critics have sometimes allowed.10This article examines photographs that document the effects of those forms of violence that, for the most part, were situated at the margins of the social documentary project of anti-apartheid photographers and that remain on the margins of histories of the struggle. 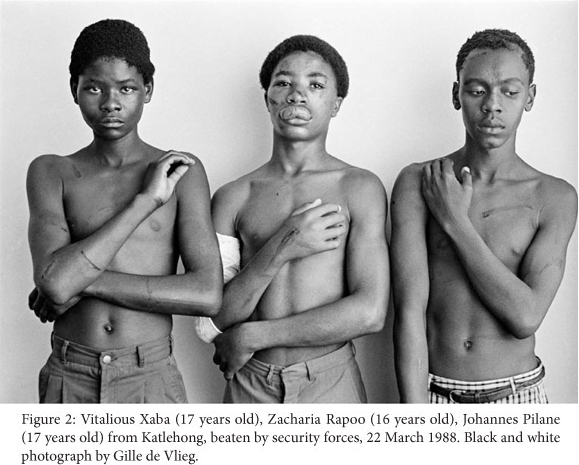 They are photographs taken by Gille de Vlieg, one of the few women members of the Afrapix collective; they are not images of 'spectacular' forms of violence, though they gesture towards those forms; and while they were circulated in a limited way under apartheid they have not achieved the iconic status of many other works by Afrapix photographers. This, I want to argue, is connected to the ways in which these images resist being assimilated into accounts that would tell the history of violence without marking the place and force of affect. Gille de Vlieg was born in 1940 in Plymouth, England and moved to Durban when she was three years old. She trained as a nurse at Grey's Hospital in Pietermaritzburg and in 1982 joined the anti-apartheid women's movement, the Black Sash. Between 1983 and 1989 she took photographs across the provinces of South Africa documenting everyday life under apartheid, forced removals, political funerals and the effects of violence. She joined Afrapix in 1984 and is one of two women whose work is included in Beyond the Barricades.13 The Gille de Vlieg photographic collection is included in the online South African History Archive and contains 581 black and white digital images. Her photographs also form part of the Afrapix collection in the University of Cape Town Library's visual archive, curated by photographer and co-founder of Afrapix, Paul Weinberg.14 In 2009 an exhibition of de Vlieg's photographs was shown in Grahamstown, and in September 2009 her show, 'Rising Up Together' was exhibited at the Durban Art Gallery.15 Her most recent exhibition, held at the University of KwaZulu-Natal in August 2012, is entitled 'Hidden from View: Community Carers and HIV in Rural South Africa' and was produced in co-operation with Amnesty International. De Vlieg's work with the Black Sash and the Detainee's Parent Support Committee provided her with a different view of the violence of apartheid from that of photographers who were working primarily for the press and profoundly shaped the kinds of photographs she took. In the section that follows I read a photograph De Vlieg took in Tembisa in June 1985 that offers a rare insight into the after-effects of the violence of that time. Many of her photographs do not portray violence as it occurs but document the events before and after. In this way her work provides some of the missing parts of the story about violence under apartheid and, as I argue here, prompts those who view them to ask different questions about the past and present. In this photograph a woman is pictured standing outside of what appears to be a house alongside a window and wall against which leans a metal bed-frame. One of the legs of the upended bed protrudes in from the side of the frame and points at the side of the woman's head, a visual metonym for the gun that killed her child. She is wrapped in mourning clothes - a blanket and a headscarf - and her head is slightly bowed. Her one eye gazes out of the image towards me, but her other eye looks askance, as if she is looking in two directions at once. One eye is accusatory and locks my gaze. Her other eye is an eye that grieves - it does not seek contact but turns away from my gaze. The woman's face does not receive me. I cannot hold her gaze and she turns me back on myself. In front of her body is the white shirt her son was wearing when he was shot. The shirt, covered in bloodstains, is the graphic description of the manner of her son's death. The stains take the shape of a limbless, truncated human body, a child's painting of the body of a child. In viewing this image I am struck by how few images like it we have from that time and how only in the wake of the Truth and Reconciliation Commission did images emerge that confronted us quite so profoundly with the long-term effects of the losses apartheid wreaked.20 De Vlieg's photograph operates as a form of evidence but also testifies to her own act of bearing witness and her recognition of the pain of the woman she depicts. De Vlieg's image, which is a political message and a statement about the personal grief of the mother who mourns her child, opens a space to reflect on mourning during and after apartheid. Her photograph can be seen as an influence for Jillian Edelstein's portrait of Joyce Mtimkulu holding up the hair of her son, Siphiwo Mtimkulu.21 In both images mothers hold up 'the remains' of their children and read together they convey the long-term suffering of black South Africans and the trauma of mothers whose children were killed in particular. The two photographs, however, were taken at radically different historical moments. The mother in de Vlieg's photograph holds up the evidence of the murder of her son and de Vlieg is her primary witness. The call for justice, for recognition of the wrong committed to her and to her son, has no clear address, is short-circuited by the absence of any real form of justice under apartheid. Joyce Mtimkulu was photographed at the Truth and Reconciliation Commission where she testified about the murder of her child. Her gaze is resolute, she has carried the pain of her son's death with her for almost fifteen years and her fist holding her son's hair is raised alongside her face, indisputable and defiant. Like de Vlieg's photograph, Edelstein's image captures a call to the law. While under apartheid the woman whose son was murdered depended on de Vlieg's photograph to transmit her message to the law, Edelstein's work documents how Joyce Mtimkulu's claim finally comes to enter the space of juridical reason. In spite of the way in which justice was negated under apartheid, de Vlieg's images, like those of other documentary photographers working at the same time, can be read as a call to and for the law. In this sense the photographs testify both to the absence of law and to transgressions of the law. Documenting such transgressions instantiates the place of law, even if only imaginary, a law without juridical force. In their stubborn acts of documenting the injustice of the apartheid regime and in their insistence on how photographs could operate as evidence, the images of those photographers who worked during the States of Emergency - times of absolute suspension of the law - hail the law into being and refuse to let go of the possibility of justice. Their images are addressed to the future, a future that the TRC sought to realise, a just future that has not yet completely arrived. A man lying on a hospital bed, except for his socks he is naked, although his skin bears so many marks it is almost as if he is clothed. Not clothed but not naked either, not in the way we usually look at an image of someone who is naked - with desire, with fascination, even repulsion. The sight of this body is mediated by the multiple marks upon it. It is mediated by pain. The man has been beaten. His skin is lacerated. His head is in the foreground of the image and his gaze is wary, he is holding his head up and is looking at someone, presumably the photographer. He is lying on a grey hooded top. At his feet are what appear to be his clothes, neatly folded. The wounds on his body are incisions in his skin. His hands are positioned beneath his head, his fingers are curled inwards. He is resting on his arms. The photograph is the sign of the event of the beating, an event that was not documented and that comes to be made visible in its aftermath. 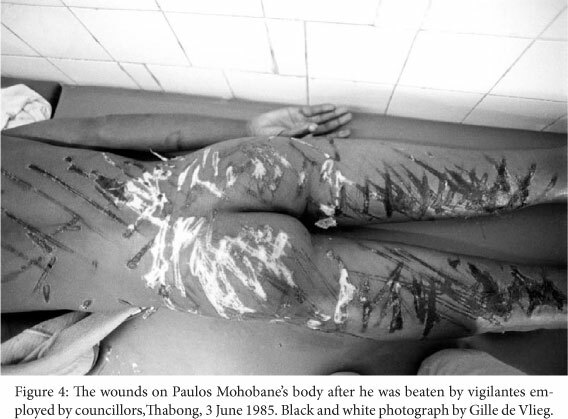 The photographs of Paulos Mohobane also stand in for the body of Daniel Mabenyane, the man who was beaten by vigilantes and who died five days afterwards. The police denied any responsibility for his death, in spite of being present when Mabenyane was first threatened and in spite of the fact that after he was beaten he was arrested and kept on the cement floor of the police station before being taken to hospital.28 In their graphic depiction of the severity of the beating he received, de Vlieg's photographs of Paulos' body indict both the vigilantes and the police for the murder of Mabenyane. 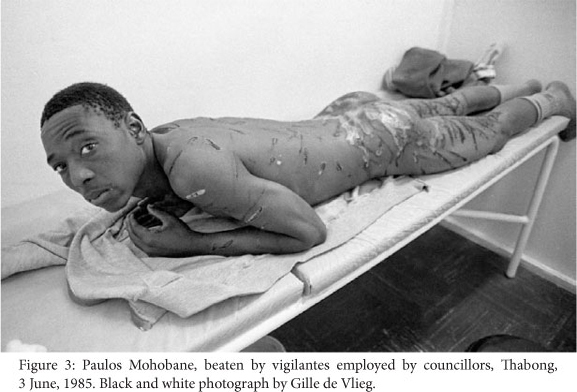 The photographs of Mohobane were also produced through another kind of exchange, as evidenced in de Vlieg's statement: 'In a way, by removing his bandages and cleaning up his wounds and taking the photos, I was giving something and not just taking the photos. '29 De Vlieg encountered Mohobane's wounded body as an activist, as a nurse, and then as a photographer. The appearance of de Vlieg's images in Haysom's book, produced as it was as an urgent publication by the Centre for Applied Legal Studies, also indicate the important role her work played as evidence. In the section that follows I argue that these images provoke and provide space for affective responses to the violence of apartheid that exceeds the instrumentalised uses to which they were put at the time of their making. But it is also important to note how in Coleman's account it is the photographs of those who had been assaulted and not the fact that they had been assaulted that 'moves' the Attorney General to action. In other words, it can be argued that these images always 'worked' through insisting on the possibility of affective response. During apartheid de Vlieg's photographs made visible forms of violence, pain and grief that were never meant to be seen. In the present her work continues to exceed and disrupt the making of seamless national historiography. I read her images as signs of the wound in history, those traumatic aspects of the past that are most difficult to archive and to lay to rest, and at the same time as objects that operate to draw our attention to the force of such traumatic histories in the present. In other words, the photographs are both signs of wounds and wounding signs, densely laden with affective force. In an interview South African photographer Jenny Gordon discussed how she could not show her photograph, 'Jeppiestown, near Troyeville, ca. late 1980s' in pub-lic.34 Of this, Hayes writes, 'The political space during the 1980s, could not contain the overflow from such a portrait. '35 The photograph portrays two women in the foreground of the image, their arms around each other, one woman's hand covers her eye and she appears to be wiping away her tears. Neither of the women is crying visibly, but both appear either to have just been weeping or about to begin to cry. It is an image saturated with sorrow. The women are standing in an urban landscape, a city street with electrical power-lines, buildings and a stationary truck in the distance. Behind the women is a white man on a bicycle who appears to be advancing towards them. The photograph has the quality of a photomontage - the man has a slightly jaunty demeanour and his clothes and hat provide him with a military look that makes him seem threatening. He appears to have cycled directly out of Europe during the Second World War. It is likely that he was simply passing by, but the visible trauma of the women imbues his presence with significance. The composition of the image powerfully conveys the disjuncture between the pain of the women and the man behind them who is oblivious to their traumatised state. In this way the photograph makes an argument about the structures of looking, about seeing and not seeing, about the indifference of white people to the suffering of black people under apartheid. However, the gaze of the photographer, who does recognise and record both the pain of the women as well as the unseeing man, transgresses the binarised codes of apartheid representation. This photograph makes visible the structures of indifference that were necessary for maintaining apartheid's racial divides and, at the same time, makes visible the pain that could not be shown. In so doing it crosses the bounds of what may and may not be seen and felt. This image, like the works by de Vlieg I discuss here, has an affective force that, as Hayes notes, could not be contained by the political space of the 1980s. Viewing the photograph now leads us to the question of whether the political space of the present can hold the 'overflow from such a portrait' and if not, to ask both why this should be so, and how it might be possible to arrive at this point of reckoning. This article has sought to argue that a critical engagement with the affective force of photographs pushes us to engage with the politics of the present. In their stillness photographs do not transport us as films do. Instead their demand is for us to think and be moved, both affectively and in the sense of being moved to action.36 The persistence of the affective that I have argued runs through de Vlieg's photographs presents a counter-argument to Sekula's view of the archive as a 'clearing house' of meaning. De Vlieg's photographs of people who have been subject to beatings and whose bodies bear the marks of multiple lashings force us to confront some of the most painful aspects of apartheid violence and to think of the violence not only in the time of its occurrence but of its aftermath. This necessitates thinking about the effects of the violence of apartheid, both psychic and material, from the perspective of the present. This afterlife of the documentary image and both the affective and critical responses it can provoke provides a powerful justification for the practice of social documentary photography. De Vlieg's photographs open an aperture in time. They disrupt linear conceptions of history through their insistent return of the past in the present. In this way these photographs call on those of us who view them to resist the violent and triumphal erasure of the trauma of the past and instead to recognise the wound that the history of apartheid remains. 1 I would like to thank the American Council of Learned Societies African Humanities Program for their financial support. I would like to thank Nicky Rousseau for inviting me to work on the Centre for the Study of Violence and Reconciliation/ University of the Western Cape, Centre for Humanities Research 'Violence and Transition Project' and for her critical engagement with my work on vigilantism. I am grateful to the anonymous reviewers for their comments on this article and to David William Cohen, Maurits van Bever Donker, Louise Green, Patricia Hayes and Sergio Alloggio for their readings and suggestions. Thanks also to Andrew Bank, Brian Raftopoulos, Paul Weinberg, and, most of all, to Gille de Vlieg for permission to reproduce her photographs and for talking to me about her life and work. 2 South African sociologists Wilfred Scharf and Baba Ngcokoto define necklacing as 'the much publicised and controversial process by which a car tyre is placed around the victim's neck filled with petrol, and set alight. It became a form of execution in the townships from 1984 onwards and was used by both pro- and anti-government groups. It is usually the action of an incensed crowd of people rather than an individual act.' (Wilfred Scharf and Baba Ngcokoto, 'Images of Punishment in the People's Courts of Cape Town: 1985-7: From Prefigurative Justice to Populist Violence' in N. Chabani Manganyi and Andre du Toit, eds., Political Violence and the Struggle in South Africa (London: Macmillan, 1990), 371. Necklacing was the preferred method for killing 'impimpis - those accused of informing on those engaged in the struggle. It is a form of violent punishment associated with apartheid but continues to be practiced in the present. On necklacing during apartheid, see Pumla Gobodo-Madikizela, 'Legacies of Violence: An In-depth Analysis of Two Case Studies based on Interviews with Perpetrators of a "Necklace" Murder and with Eugene de Kock' (Unpublished Ph.D. thesis, University of Cape Town, 1999); and Riedwaan Moosage,'The Impasse of Violence: Writing Necklacing into a History of Liberation Struggle in South Africa' (Unpublished M.A. Thesis, University of the Western Cape, 2010). 3 Xolani Koyana. Angry Residents Back Kangaroo Court Killings', Cape Times, 21 March 2012 (4) and Xolani Koyana. 'Justice Breakdown in Khayelitsha', Cape Times, 26 March 2012 (5). 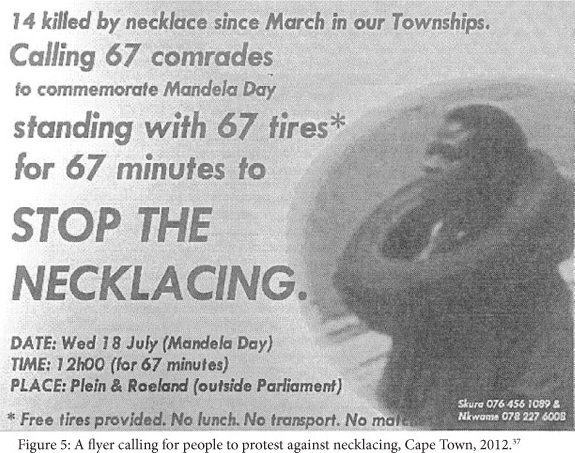 On 21 March 2012, when the photographs of the necklacing were first published in the Cape Times, the photographs were attributed to West Coast News and the article that accompanied the images noted that they were taken on a cellphone and made available to the newspaper by a resident. The photographer is not named in the Cape Times but the images are attributed to West Coast News reporter Nombulelo Damba in online sources. When one of the same images was reprinted on 26 March the caption read: 'A cellphone camera captures three men, below, who were necklaced last week after a kangaroo court found them guilty of stealing a generator.' The image of the site of the necklacing, taken the day after the event occurred, is attributed to Jason Boud. 4 Addressing a large crowd of residents in the aftermath of numerous necklace murders that took place in the townships of Khayelitsha and Nyanga in 2012, Police Minister Nathi Mthethwa called for people to work together with the police rather than to resort to what he has termed 'senseless killings'. President Jacob Zuma has used the term in his statement on what he has termed the 'tragedy' of the Marikana Massacre stating: 'We are shocked and dismayed at this senseless violence'; 'Lonmin "deeply regrets" Marikana mine deaths', BBC News, 17 August 2012. Accessed 12 September 2012, http://www.bbc.co.uk/news/business-19293711. 5 While I do not employ Roland Barthes' notions of 'studium' and 'punctum' in my readings of photographs here, my approach to the question of affect and my thinking on photographs as wounding and as signs of wounds is indebted to his work. See in particular Roland Barthes, Camera Lucida: Reflections on Photography (Trans. Richard Howard. New York: Farrar, Straus and Giroux, 1981). 6 For a brief history of Afrapix see http://www.sahistory.org.za/visual -arts-and-architecture/afrapix. For a scholarly account of the collective see Patricia Hayes, 'Power, Secrecy, Proximity: A Short History of South African Photography', Kronos, 33 (2007), 139162. See also Omar Badsha, ed., South Africa: The Cordoned Heart (Cape Town: Gallery Press, 1986) and Omar Badsha, Gideon Mendel and Paul Weinberg, eds., Beyond the Barricades: Popular Resistance in South Africa (New York: Aperture Foundation, 1989). Each book contains selected works by twenty Afrapix photographers. 7 For images that contain the UDF slogan, see the works by Omar Badsha, Myron Peters and Dave Hartman in Beyond the Barricades on pages 25, 30 and 95 respectively. 8 I use the terms 'Afrapix archive' and 'Afrapix collection' in this article, but it should be noted that there is no singular Afrapix archive. The works of photographers who were part of the collective can be found in, among others, the UWC-Robben Island Mayibuye Archives, the University of Cape Town Visual Archives, the Impact Visuals Collection at the University of Connecticut Library and the South African History Archive. 9 It is important to note how Afrapix worked alongside and through other anti-apartheid organisations, including the trade unions, student unions and the United Democratic Front. See my discussion of the importance of Gille de Vlieg's involvement in the Black Sash for understanding how and why she came to take the photographs she took below. 11 While this paper examines photographs by women, I do not take up the question of gender and affect. The argument I am making here seeks to articulate the relation between affect and political response and takes heed of the feminist critique of 'the slip between feminist empathy and women's natural capacities for care'. Clare Hemmings, 'Affective Solidarity: Feminist Reflexivity and Political Transformation, Feminist Theory, 13, 2 (2012), 152. For a useful overview of the field of thinking 'affect' see Marta Figlerowicz, Affect Theory Dossier: An Introduction, Qui Parle: Critical Humanities and Social Sciences, 20, 2, (2012), 3-18. See also Melissa Gregg and Gregory J. Seigsworth, eds., The Affect Theory Reader (Durham: Duke University Press, 2010). 12 This title is the name of a song from the album Genes and Spirits by South African Jazz musician, Moses Taiwa Molelekwa, who was born in Tembisa in 1973. He committed suicide in 2001. 13 There were seven women photographers associated with the Afrapix collective: Gille de Vlieg, Lesley Lawson, Deseni Moodliar, Wendy Schwegmann, Zubeida Vallie and Gisele Wulfsohn. Claudia Marion Stemberger cites South African artist Penny Siopis who claims that Afrapix developed a 'machismo element' and notes that 'The few women participating in Afrapix had connections to women's rights organisations and got involved in feminism, like Lesley Lawson and Gille de Vlieg'. See Claudia Marion Stemberger,'Spot on South Africa: Women Photographers - An Interview with Pam Warne, Curator of Photography and New Media at Iziko Museums in Cape Town', Eikon: International Magazine for Photography and Media Art, 70, 2010. Available online at http://www.artandtheory.net/, accessed 6 June 2012. For a more extended discussion of women photographers in Afrapix see Patricia Hayes, 'The Form of the Norm: Shades of Gender in South African Photography of the 1980s', 263-277. See also Penny Siopis, 'On Both Sides Now: Fifty Years of South African Women behind and in Front of the Lens" in Robin Comley, George Hallett and Neo Ntsoma, eds., Women by Women: 50 Years of Women's Photography in South Africa (Johannesburg, Wits University Press, 2006), 9-14. 14 The University of Cape Town visual archive contains 350 black-and-white prints by Gille de Vlieg and one colour slide. The photographs are currently being digitised. 15 For a review of the exhibition, see Rike Sitas, 'Rising Up Together: Gille de Vlieg at Durban Art Gallery', Accessed 6 June 2012. http://www.artthrob.co.za. 16 De Vlieg described how she stopped taking photographs for a time after Afrapix disbanded and how her activism and photography were inextricably linked. She said that she saw herself as an activist who also took photographs, whereas she says of the other Afrapix members that 'they were activist photographers, they saw themselves as photographers'. Interview with Gille de Vlieg, Cape Town-Durban, 7 June 2012. 17 De Vlieg talked about how the Black Sash made it a policy to attend funerals and events as they felt that 'If white people were present, there would be less violence from the police.' Interview with Gille de Vlieg, Cape Town-Durban, 7 June 2012. 18 In the interview I conducted with her, de Vlieg related how the police came to detain her in the middle of the night and how her son, who was a high-school student, was almost assaulted. 'I never really understood why it was I was in detention. I had a brother in exile so I thought it may have been to do with that. I spent a lot of time in Tembisa, taking people to hospital and generally being a form of support but they never questioned me about Tembisa...' Of her activist work in Tembisa, de Vlieg recalled, 'In 1984 I went to Tembisa with COSAS students, I was protected by COSAS students and I never felt unsafe there except from the police.' Interview with Gille de Vlieg, Cape Town-Durban, 7 June 2012. 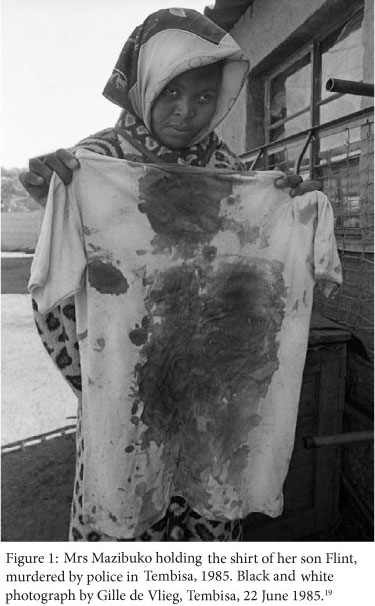 19 This photograph is captioned as follows in Beyond the Barricades: A mother holds up the bloodstained shirt of her son, shot in the back by police, Tembisa township, Transvaal, June 1985. According to government statistics, 381 people were killed in "unrest" incidents between September 1984 and April 1985. The government's own statistics acknowledge that three quarters of these victims died as a direct result of police action' (54). 20 De Vlieg also described how few forms of support there were under apartheid for people to deal with their traumatic experiences. She recalls the Detainee Parents Support Committee tea parties as providing 'a safe place for women to talk about what was going on in their lives'. She also talked of how she thought people would come to the Black Sash advice offices 'even though they knew we couldn't help them, just to have someone listen to them.' Interview, with Gille de Vlieg, Cape Town-Durban, 7 June 2012. 21 Edelstein's photograph of Joyce Mtimkulu appears in her book Truth and Lies: Stories from the Truth and Reconciliation Commission in South Africa (UK: Granta Books and South Africa: M&G Books, 2001). For an analysis of her work and an account of the murder of Siphiwo Mtimkulu, who was killed by the Security Police in the Eastern Cape in 1982, see my article 'Photography, Apartheid and the "Road to Reconciliation'", Transition, 107 (2012), 79-89. The photograph of Joyce Mtimkulu was also used as the cover of the first edition of Antjie Krog's Country of My Skull but in later editions was replaced by an image, first of Krog herself, then of a landscape, and most recently an image in pastel-tones of balancing stones. In this article I raise the question of whether public space has opened up in post-apartheid South Africa for affective images and the histories they convey. The disappearance of the portrait of Joyce Mtimkulu from the cover of Krog's book seems to signify that spaces for expressing and containing what Patricia Hayes has termed 'overflow' are fewer now than ever before (Hayes, 'The Form of the Norm, 275). De Vlieg's photograph of Vitalious Xaba, Zacharia Rapoo, Johannes Pilane (Figure Two, reproduced above) can also be read as a precursor to Edelstein's photograph of Thembinkosi Tshabe and Mxolisa Goboza, photographed in 1997. This image appears on the cover of Edelstein's Truth and Lies. 22 Nicholas Haysom, Mabangalala: The Rise of Right-wing Vigilantes in South Africa (Occasional Paper No. 10, Centre for Applied Legal Studies, University of the Witwatersrand, Johannesburg, 1986), 1. 24 Badsha, Mendel and Weinberg, Beyond the Barricades, 55. 26 Interview with Gille de Vlieg, Cape Town-Durban, 7 June 2012. 27 When I first saw this photograph, I assumed that Mohobane was being treated at the hospital. Gille de Vlieg informed me that, in fact, on hearing of the delegation's visit, the young man came from his home to testify to what had happened to him. He was not receiving ongoing medical care. 29 Interview with Gille de Vlieg, Cape Town-Durban, 7 June 2012. 30 SASH Magazine, 28, 2 (Aug. 1985). I am grateful to Gille de Vlieg for drawing my attention to this report on the Black Sash visit to Thabong. For more on the work of the DPSC, see also Audrey Coleman's testimony before the TRC on the 12th of June 1997 at the Johannesburg Children's Hearing. Accessed 11 June 2012. www.justice.gov.za/trc/special/children/acoleman.htm. 31 The value of the photographs is now linked to the names of the photographers rather than to their subject. See Douglas Crimp's essay on photography in the museum which includes a discussion of the reclassification of photographic materials in the New York Public Library: 'These materials are thus to be reclassified according to their newly acquired value, the value that is now attached to the "artists" who made the photographs. Thus, what was once housed in the Jewish Division under the classification "Jerusalem" will eventually be found in Art, Prints and Photographs under the classification "Auguste Salzmann™(Douglas Crimp, 'The Museum's Old, The Library's New Subject" in Liz Wells, ed., The Photography Reader (London: Routledge, 2003), 422-427. 32 Allan Sekula, 'Reading an Archive: Photography between Labour and Capital' in Liz Wells, ed., The Photography Reader, 444-445. 33 For a discussion of repression in relation to apartheid, see Sergio Alloggio and Kylie Thomas, 'Forgetting Responsibility: Hannah Arendt and the Work of (Undoing) Psychic Resistance in Post-Apartheid South Africa', African Yearbook of Rhetoric, 3,2 (2012), 119-130. 34 The interview with Jenny Gordon was conducted by Patricia Hayes, Farzanah Badsha and Natasha Becker in 2003 and is cited in Hayes, 'The Form of the Norm', 268. 35 Hayes, 'The Form of the Norm', 275. 36 For political philosopher Hannah Arendt, it is the permanent and mutual relation between thinking, feeling, willing and judging that makes it possible for us to avoid the state of being that Adolf Eichmann described at his trial as 'kadavergehorsam [the obedience of a corpse]. See Hannah Arendt, The Life of the Mind (New York: Harcourt Brace Jovanovich, 1978). See also Jose Brunner, 'Eichmann, Arendt and Freud in Jerusalem: On the Evils of Narcissism and the Pleasures of Thoughtlessness, History and Memory, 8, 2 (1996), 61-88. 37 I would like to thank Nkwame Cedile, one of the organisers of this protest, for granting me permission to use this image. Cedile is an activist who fasted for nine days to protest against the necklace killings. See http://www.groundup.org.za/content/man-hunger-strike-protest-against-vigilante-killings.